A vibrant and fresh expression of café culture overlooking Mccarren Park in Brooklyn, New York. With an Art Nouveau inspired design, Sauvage offers a comfortable and elevated café environment with a focus on the wild and untamed nature of New York now. Sauvage conjures a strong bond to the farmers, animals, producers, and the land that feed us. The menu focuses on heritage and locally sourced vegetables and meats. The beverage menu displays an emphasis on biodynamic, small producer wine and spirits, and a continually rotating coffee and tea list. We accept reservations online and by phone 30 days in advance and offer terrace seating throughout the year. We look forward to you joining us. Sauvage is a French bistro-like spot from the people behind the OG Williamsburg cocktail spot Maison Premiere. The decent interior design is the only positive point about Sauvage. The food is poor, and it is not worth a fraction of the price they charge. The selection of Drinks is mediocre. The staff though is attentive and helpful. The food was delicious, the decor beautiful, the staff lovely—but it was much, much too loud! We had such a lovely time here for my boyfriend’s birthday! Food and service were both great, especially the artichoke hearts, and the cocktails were beautiful. The hosts even went out of their way to help us get a backpack back after we’d left it behind - much, much appreciated. Thanks so much for a great evening! It seems like they’ve got some kitchen issues. Our food arrived lukewarm. They were kind enough to remake, but it came out just a touch warmer than the first time. Cocktails were great, but took an obscenely long time to come to the table. Our server was great. Seems like a great lunch option, but definitely not worth checking out for a date night. I usually love every bite at Sauvage but they were off tonight. It was a beautiful day so a friend and J decided to go to Sauvage for Brunch! Ion a vegetarian and go the gran bowl and it was delicious! They were accommodating and found us a table outside because I brought my dog, it’s a great place to get a bite to eat on a sunny day. Great for people watching and right across from the park! Excellent service and food! Highly recommend it! Had been before for brunch and much prefer brunch than dinner. The dinner menu is quite limited and very traditional French cuisine and pricey. Cured ham, beets, and fish were amazing. Pork was very salty though, did not enjoy it. Restaurant was great, seated us early! Service was quick. Food is typical French bistro. Chicken was too salty and steak was very good. Wines by the glass are what you would expect - dull. Got noisy towards the end when a large group came to sit next to us. We are from Long Island and we wanted to try something new in a new area we haven’t yet explored. I found This place on google and gave it a try for my fiancé bday. I had the mussels to start and they were big and tasty! Then I had the trout! It was full which is something I never usually get but it was filets so there were hardly any bones which was nice! My fiancé had the beef tar tar and the steak au puave , which were both tasty. The best part was the knowledgeable server we had. Her name was Betsy. She was able to tell us about all the wine they had by the glass bc I wanted white and he wanted red. She let us try the ones we were stuck on to see which we liked the best. She was pleasant through the entire meal. Food was delicious. Next time I am in NY I will definitely go back to this restaurant. Decent service, small portions, food not that great (entrees and dessert) and certainly over-priced. Best thing was the atmosphere and my virgin cocktail! Thank you so much again for making our Valentine’s Day celebration so special. Everything was incredible expensively the service . Thank you!! The food. Service was good.. We appreciated the staff great service and ambiance. I greatly enjoyed the meal. Good bread, enjoyed the celery root gratin. Drinks were good, fresh citrus juice and zest. Surprisingly the music was great. While much of the food at Sauvage was excellent, the service makes me hesitant to recommend it at this time. Maybe they are still working out the kinks, but water glasses remained unfilled, wine glasses not cleared (and no ask for a refill, which is economically silly)... our guests that came late were asked to order food before being provided a water glass or offered a cocktail, and an ask for dessert menus, oddly, took 10 minutes. There is plenty to recommend by way of food: the skate was amazing, the roasted artichokes delicious, even the olives as a snack were excellent (so were the almonds, though super pricey for almonds). There's a lot of potential here; but the service needs to get much better. I always enjoy Sauvage and the head of the bar has been turning out fantastic cocktails for at least two years if memory serves me right. I love the neighborhood vibe and consistent food. I’ve come here many times and will continue to return. Food was good but we were seated 45 minutes after our reservation, with nothing to show for it. Then the first thing the waiter said after we sat was "are you ready to order food?" I had very high expectations for Sauvage and was excited to try it but was sadly disappointed by the service. Food was decent but likely wouldn't go back. Only complaint was sausage was dry. The restaurant is quite attractive (esp. the gorgeous menus). And, the staff is very friendly. But, our food was not good and it was expensive. Specifically, two ppl from our party ordered the special of the day which was Smoked Trout Benedict and we could barely eat it (and it was $20)! The English muffin was super soggy, the fish’s consistency was off, and the greens on top were bland. It was a disappointmenting meal. Excellent "vintage" ambience - very romantic and classy. Great food, mostly French-inspired classics, presented beautifully. The wine list is a real treat, featuring cult classics like Yvon Metras and Clos Rougeard, as well as many astute choices under $75. You can't go wrong. Staff is thoughtful, but not obtrusive. The best date spot in the neighborhood. Waitress Betsy was terrific. Smooth, quietly attentive. We enjoyed her recommendations. She made us feel well cared for. Sauvage was spectacular. The ambiance of the restaurant is the first thing you notice - which alone is worth stopping into. Then the warm and kind service we received was just wonderful. I went with a friend for brunch and it was perfect if you're looking for a cute, not-so-boozy eating experience. I'm sure the drinks are great, but we stuck with just eating. The food was delicious as well. I had high hopes for my dinner at Sauvage. I live in the neighborhood and had been to Sauvage for brunch a few times and had always had a wonderful experience. I was very excited to take my brother there for a New Years dinner. We ordered the bread and butter ($3) which was warm and delicious, as well as the cured ham ($15), which was amazing. The ham was great with the little pieces of bread, or alone. My brother ordered the steak frites ($29). The plate was 3/4 full of fries which were very tasty, and the steak was cooked as desired, and well seasoned by small. Overall, it was not worth the price. I ordered the skate ($26), which I was very excited about. The skate came with cauliflower and a caper sauce. It was all entirely too salty. Capers alone are very salty, but the additional seasoning on the fish and cauliflower made the dish almost inedible. Needless to say, it wasn't worth the price. I've had good experiences at Sauvage in the past, but this last trip made me question whether or not I'd return. Went for NYE, was really unimpressed with the food and ambiance. Our waitress was fantastic, however. The service was laughably terrible. If the server had been honest it could have been salvaged but he repeatedly lied to our face. Worst customer service I have experienced in a restaurant. Luckily the 2 hour fiasco in a near empty restaurant was in good company. Great brunch spot I randomly chose to meet with friends. Service was great even though it was very hectic, our waitress was super and handled everything like a boss. We really enjoyed the overall meal. Great food, drink, and service. Thanks for making our Thanksgiving very special! Nice server. Food however was way too expensive (special Thanksgiving menu) for the quality. Stuffing with turkey was not good. Soup was too sweet. 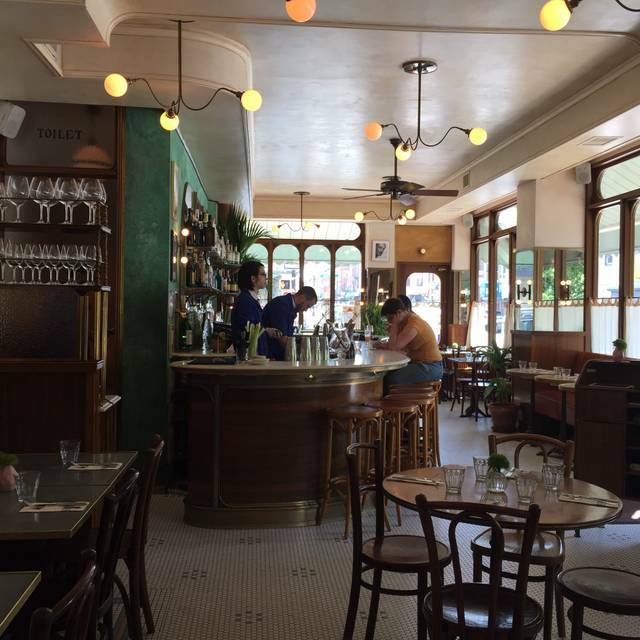 A bit of Paris in Brooklyn. Great food, drinks, wine, atmosphere and service. Between family, friends and myself we have tried everything on the menu ( except for the pig head confit ) and everything has been excellent. But my favorite is their burger which is the best I've ever had in my life and will probably keep getting every time I go there. It's. Just. That. Good. We spent a most enjoyable Sunday evening at Sauvage, with dinner and drinks at the bar. The wine sommelier is very knowledgeable and helpful with the extensive list, whilst respecting our budget! The young lady running the bar is a real expert with a deep knowledge and transparent enthusiasm for some rare and obscure spirits. It is not cheap but then you get what you pay for - and in our case more. The bar was quiet and we enjoyed an informal tasting with her expertise coming to the fore.